It has been quite a while since I have had the time/energy/patience/lack-of-other-priorities to spend any sort of time on Savor This. In fact, it seems like ages since I’ve crafted any new recipes worth writing down and sharing. But the day before yesterday I found half an hour to go for a walk in the sweltering heat and I dreamed up a tasty appetizer. And today I found a little time to cook it and eat it. And it is definitely worth sharing. It started with an avocado (and if you know me at all you will assume that Food52 is having an avocado contest). There are a couple ways I enjoy avocado that are not just on toast with salt and lime. Mostly I think of a Japanese-ish dish- either paired with a sticky, sweet glazed meat or mixed with a bit of mayo. Both versions are usually served with sticky rice and are garnished with cucumber, sesame seeds, and sometimes pickled ginger. Those dishes are decent without avocado, but stellar with it. As I already had a pretty good recipe using trout in place of the usually sweet eel with an avocado cream sauce I decided to try to transform those flavors into a non-Japanese dish. I still wanted a slightly sweet, deep brown sauce, and settled on a brown butter balsamic that I usually drizzle on green vegetables. But I was still thinking Japanese when I remembered a crispy rice cake topped with spicy tuna, avocado and an eel sauce from Japango. I decided I could use a different grain like barley for the cake and hazelnuts instead of sesame. I started by cooking up a pot of pearl barley. I let it get very soft and stirred it a lot at the end to release the starches. Taking it a step further, I blended half the pot with an immersion blender to make a consistency like oatmeal. Once it was cool enough to handle, I formed some cakes and made the butter sauce. The cakes fried up really crispy and nutty and were a great platform for the creamy avocado. The sauce needed a little more sweet so I added a bit of honey. To finish the dish I garnished with the nuts and some green onion. While I still love love love the crispy rice/tuna version, this was a great twist and opened up all sorts of possibilities. Rinse barley and drain well. Heat 1 T oil in a medium sized pot and toast barley until it begins to brown a bit. Add water and 1 t salt, bring to a boil and simmer until very thick and creamy. Set a timer for about 25 minutes and stirred frequently toward the end to avoid sticking on the bottom and to break up the starches a bit. The barley should be very tender and very creamy so add a bit more water if needed. Let cool slightly and blend half the barley with a hand mixer or blender and stir back in to the rest and season with salt if needed. Allow to cool enough to handle and then form into small patties. You might want a bowl of water to dip your hands into as the mixture gets pretty sticky. Toast hazelnuts in a small pan over medium heat, stirring often until beginning to brown. Fold into a clean kitchen towel or napkin and press and rub to remove the skins. It is ok if some skins are remaining. Coarsely chop. Add butter to pan and cook until the solids begin to brown. Whisk in soy, vinegar and honey and pour into a bowl. Taste for salt- you might want to add a pinch. Heat 1/4″ of oil in a large pan and fry barley cakes until nicely browned on each side, draining on a paper towel. Cut avocado in half and (carefully!) whap a sharp knife across the pit, twist slightly and remove. Cut thin slices of avocado and, using a large spoon, scoop avocado from skin. Thinly slice green onion. 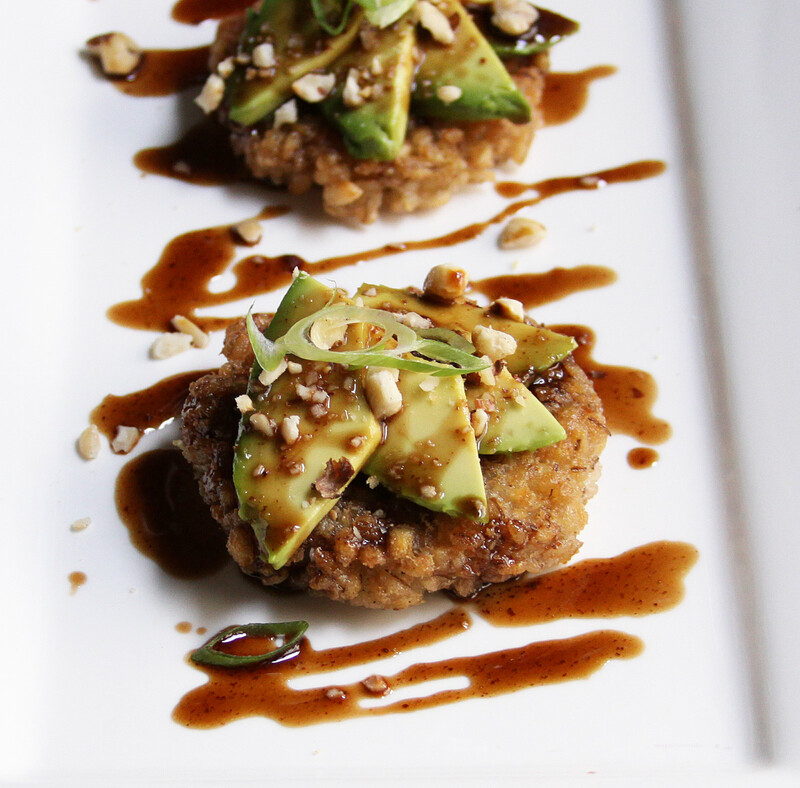 Place a few slices of avocado on each cake, drizzle with sauce and garnish with hazelnuts and green onion. Enjoy right away.